One of the things I enjoy doing is following the exploits of present-day adventurers and explorers. I am especially interested in what makes them tick and why they take the kinds of risks they take. Whether some intrepid adventurer is trekking to the top of the world, slogging through snow at the bottom of the world, or rowing across an ocean, technology makes it possible for us to vicariously travel along. And because we live in a connected world, we are not likely to see again the kinds of sagas reminiscent of explorers like Sir Ernest Shackelton or Douglas Mawson. These two adventurers survived lengthy and life-threatening ordeals during the Heroic Age of Antarctic Exploration — the period from 1897–1922 during which sixteen major expeditions from eight countries focused on the Antarctic continent. These guys had no way to call for help. In recent days I have followed the adventures of Eric Larsen and his Cycle South Expedition 2012 — an attempt to ride 750 miles from Antarctica’s Hercules Inlet to the geographic south pole. 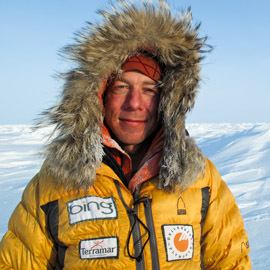 Larsen has previously climbed Mount Everest and trekked across the planet’s frozen poles. Larsen’s Cycle South Expedition combined adventure with advocacy. 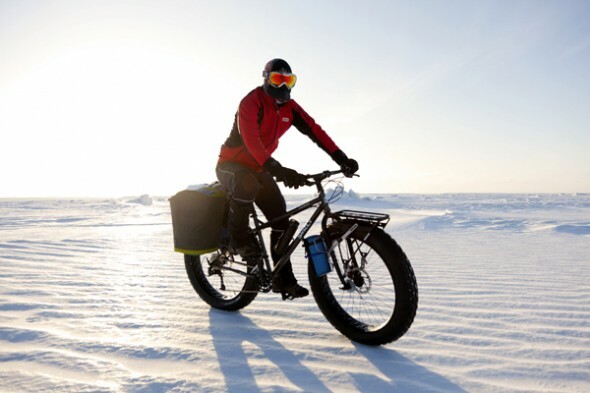 He wanted to be the first person to ride a bicycle — yes, a bicycle — to the geographic South Pole. Why? Because he is passionate about demonstrating the many ways in which people can use bicycles to protect our environment and improve the quality of their lives. Sadly, hardly two weeks into his adventure, Larsen had to turn around because he was averaging less than ten miles a day, a pace too slow to make it to the pole with the food and supplies he carried with him. Rather than run out of food and risk not being rescued, Larsen turned around. I applaud Larsen for his heroic attempt but also for knowing when to turn around so that he could live to ride another day. If Sir Ernest Shackelton was alive today, he would understand. In September 1909, Shackelton and three companions trudged to within 96-miles of the South Pole. However, finding themselves dangerously short of supplies, Shackleton made the most difficult decision of his life — he turned his men toward home. He later told Emily, his wife: “I thought you’d rather have a live donkey than a dead lion.” Shackelton returned to Antarctica in December 1914 in hope of being the first to complete a trans-Antarctic crossing. Instead he gave the world one of the greatest and most inspirational survival stories of all time. He is one of my historical mentors and heroes. I hope that Larsen will return to Antarctica to try again. I am one who believes that our world needs more people like Larsen — folks who are not afraid to attempt hard things and who inspire others to do the same. Larsen’s recent attempt to cycle south is only a chapter in his story, but it is not the end of the story. The next time you attempt to do something hard, remember guys like Larsen and Shackelton. And if you don’t make it, then don’t let that be the end of your story. Pick yourself up and try again. It’s just like riding a bicycle!